David draws on his 20 years of yoga practice as he attempts to maintain a beginner’s mind. Utilizing a non-striving and non-judgmental process of observation, he returns to his mat again and again for another magic carpet ride.His approach is informed by his incredible teachers who have blessed him with their knowledge, mindfulness, and kindness: Harvey Deutch, Stacey Rosenberg, Darren Main, Janet Stone, Rusty Wells, and the list goes on and on.While focusing on breath and alignment, David continually investigates what polarities can be merged within life – such as, what he fears and what he desires, and what he clings to and what repels him. 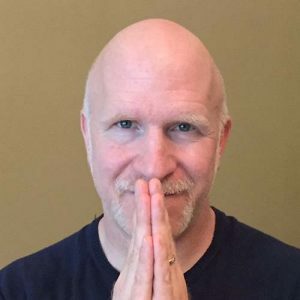 With this attempt to synthesize opposites, David aims to foster social and communal development through his individual practice.Inhale, exhale, rinse, repeat.